LANSING — A fund tied to the husband of the House Insurance Committee’s new chairwoman received $80,000 last fall from a group that lobbies on behalf of insurance companies. The account then paid most of the money to a business a legislative staffer had filed paperwork to help form. According to filings with the Internal Revenue Service (IRS), the Leading Michigan Forward Fund, an administrative account run by Rep. Lana Theis' (R-Brighton) husband, Samuel Theis, received $80,000 from the Michigan Insurance Coalition on Sept. 13, 2016. 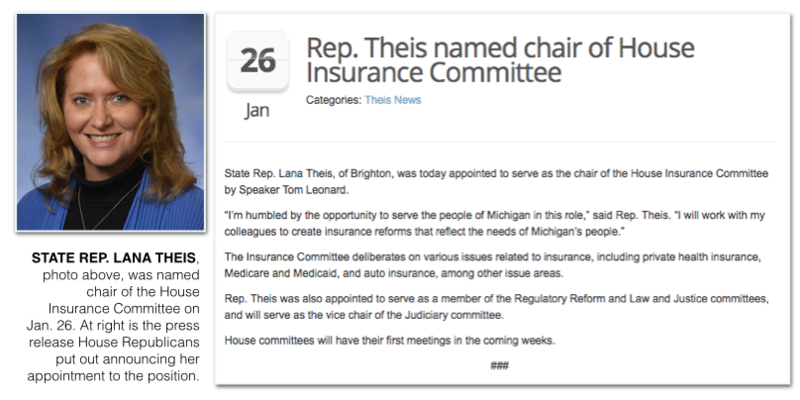 Lana Theis became House Insurance Committee chairwoman in January 2017. According to its website, the Michigan Insurance Coalition’s members “are insurers who annually underwrite more than $3 billion in insurance premiums in Michigan.” The coalition has been an advocate of reforming Michigan’s auto insurance laws. After the $80,000 contribution, the Leading Michigan Forward Fund paid $68,924 to Victory Graphics & Consulting from Oct. 16 through Nov. 3, according to IRS filings. Meghan Reckling, who became Theis’ chief of staff in 2015, filed paperwork with the state to help officially organize the company on Oct. 6. The company’s address is 620 N. Kane Road, Webberville, the same address listed on IRS filings for the Leading Michigan Forward Fund and on campaign disclosures for Theis’ official candidate committee. 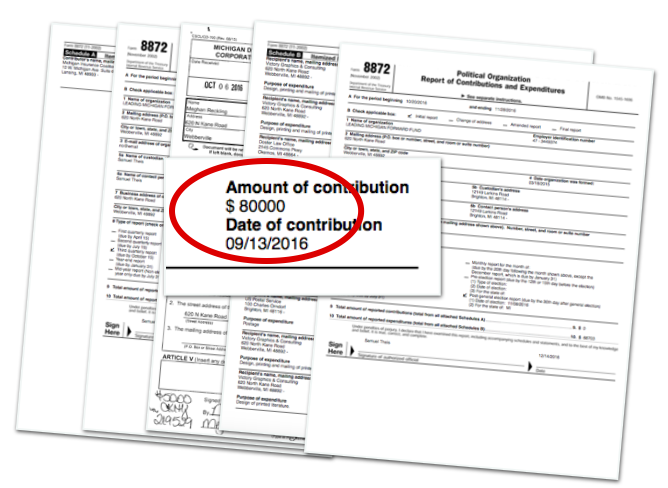 Rep. Lana Theis’ husband, Samuel Theis, is the official contact person and designated record keeper for Leading Michigan Forward Fund, according to its IRS paperwork. In a phone interview last week, Samuel Theis said the account was set up as a “leadership fund” to support other GOP candidates as Lana Theis was seeking a leadership position within the House GOP caucus. However, Eric Doster, an attorney who works for the fund, said this week that he would not use the words “leadership fund” to describe it. Decisions regarding the fund were made by Samuel Theis, independently of Lana Theis, Doster said. And Samuel Theis clarified this week that he was confusing the administrative account with a leadership political action committee (PAC) connected to Lana Theis, the Liberty Freedom Fund. Although Samuel Theis is the lawmaker’s husband, Doster maintained there is “no connection” between the Michigan Insurance Coalition contribution to the fund and Lana Theis. Both Samuel Theis and Doster said the intent of the fund was to help Republican candidates in close races. And both also said that nothing improper had happened with the fund. If the $80,000 given to the fund had been a contribution to a candidate’s campaign, it would be eight times the maximum contribution amount allowed to a State House candidate committee for each two-year cycle in Michigan. The amount of that single contribution is more than Lana Theis’ official candidate committee has reported raising for the entirety of 2015 and 2016: $57,563. The Leading Michigan Forward Fund didn't have to report to the Michigan Secretary of State’s Office because the fund didn’t expressly work to advocate for a candidate’s election or defeat. According to Doster and Samuel Theis, the fund, which reports to the Internal Revenue Service, engaged in issue advocacy that benefits candidates but doesn’t specifically encourage people to vote for them or against them. Both Doster and Samuel Theis said the race for the 57th House District seat between Republican Bronna Kahle, of Adrian, and Democrat Harvey Schmidt, of Tecumseh, was one in which the fund had sent out mail. Kahle won. Through a routine search of IRS documents, MCFN noticed the fund because of the $80,000 contribution, which is higher than the usual amounts of less than $20,000 given to administrative accounts based in Michigan. The Michigan Insurance Coalition’s $80,000 contribution was also the only contribution that the Leading Michigan Forward Fund had reported as of Nov. 28. The fund received additional contributions in December from Caremark RX Inc. ($500) and from Aetna ($250). House Speaker Tom Leonard (R-DeWitt) announced last week that Lana Theis would become chairwoman of the House Insurance Committee for the 2017-2018 session. Leonard himself held that position during the 2015-2016 session when Lana Theis was his vice chair. Asked why the coalition had given such a large contribution to the account and whether it had given such large contributions to accounts connected to other lawmakers, Mark Fisk, spokesperson for the Michigan Insurance Coalition, replied in an emailed statement. “The Michigan Insurance Coalition is proud to participate politically to advocate for the more than 30,000 men and women who work in the insurance industry, and to support lawmakers from both parties who support growing jobs and improving Michigan’s economy,” Fisk’s statement said. If Leading Michigan Forward Fund had been a nonprofit organization, it wouldn’t have had to report its donors to the public, but it also would have had to engage in social welfare activities in addition to its political activities. An investigation by MCFN and MLive in 2016 found that at least one in every three state lawmakers is connected to an administrative account or nonprofit that falls outside normal campaign finance disclosure requirements and that can accept money from corporations. In its newest filing made in January, the Leading Michigan Forward Fund reported paying Cornerstone Associates $710 for tax and legal services. According ot the company's website, Samuel Theis founded the company. Samuel Theis said Cornerstone Associates has been keeping the records for the fund. Leading Michigan Forward Fund paid $300 to M. Mason Designs last fall, according to IRS filings. M. Mason Designs also has a 620 N. Kane Road, Webberville, address. Reckling, who Lana Theis announced would be her chief of staff in 2015, is the owner of M. Mason Designs, according to the business’s website. MLive did an extensive investigation in 2015 into legislative staffers in Michigan doing political work on the side in addition to their legislative duties. Reckling and Lana Theis didn’t respond to requests for comment themselves, but Doster responded after MCFN reached out to them. Gideon D’Assandro, spokesperson for the House Republicans, said Reckling had approval from House leadership to work for Victory Graphics & Consulting in addition to her legislative duties. Staffers are supposed to get such approval for paid work they do on top of their work for the Legislature.